Stargazers from around the world come to Bryce Canyon National Park to experience one of the most spectacular night skies in the United States. To meet demand, rangers offer astronomy programs three times a week during the peak summer season and every Saturday the rest of year -- even on winter nights when snow covers the ground and temperatures fall well below zero. "It knocks people's socks off, seeing distant galaxies and star clusters with the naked eye that you usually need a small telescope to see," said Kevin Poe, the park's "Dark Ranger." In a high, dry and remote part of Utah, Bryce Canyon is one of the darkest spots measured in North America and boasts 305 cloudless nights a year, making it "perfectly poised to become a night sky mecca," Poe said. 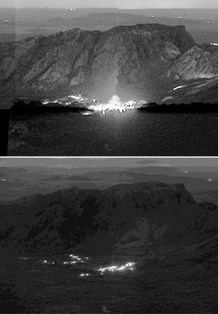 The dramatic difference dark-sky-friendly lighting can make is captured by images taken before and after Big Bend National Park replaced its outdoor lights in the Chisos Basin. Photo courtesy of the National Park Service. But a fast-growing metro area less than 60 miles away and a proposed expansion of a nearby coal mine threaten to degrade the darkness -- and the local night sky tourism industry -- with light pollution. Bryce Canyon is not alone. Artificial light is pouring into national parks across the country, not only diminishing the quality of the night sky for stargazers, but affecting flora and fauna that depend on dark nights for survival. "It doesn't take very much light at all to obscure darkness," Poe said. Just one streetlight in the parking lot where he sets up his telescopes would cut the number of stars visitors could see from 7,500 to about 2,000. With the expansion of energy development across the West, and population growth more broadly, National Park Service officials warn the problem is only going to get worse -- unless developers, cities, utilities and homeowners make a conscious effort to install dark-sky-friendly lighting. "It's not an intractable problem," said Chad Moore, night skies program manager for NPS. "The light that is in the night sky and the light in the natural environment is not a necessary byproduct of a productive society. It's a waste. What we're asking people to do is curtail that waste." The Park Service is charged with protecting the nation's natural, cultural and historic resources for future generations -- which includes nightscapes. But the agency can only control the lighting within the boundaries of its parks, so rangers work to educate visitors about light pollution and what they can do about it at home. "The most difficult problem for the National Park Service is to help visitors understand that when they've left home to visit a park for the weekend, if they left the porch light on, it has followed them to the park," Moore said after a recent screening of the documentary about losing the night sky called "The City Dark." Seeing a truly dark night sky can have a profound impact on visitors who have not given much thought to the fact that a glowing orange night sky without stars is abnormal. "They don't understand what they are missing," said Tom Dansie, community development director of Springdale, the gateway town to Zion National Park in Utah. "Visitors come from Las Vegas, Los Angeles, and say, 'I had no idea this is what that night sky looks like.'" Those visitors are often inspired to implement simple changes at home like shielding lights or turning them off to improve the night sky in their own communities, Dansie said. 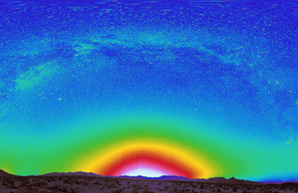 Since 1999, Moore has been photographing the night sky in national parks to measure light pollution. By using stars of known brightness to calibrate the image, he and his team are able to calculate how much artificial light is in the night sky. The result, more often than not, is a panoramic image revealing colorful bulges of light over towns both near and far. For example, the powerful lights of Las Vegas lit up the sky over Lake Mead National Recreation Area from about 40 miles away, but so did the smaller cities of Bullhead City and Kingman, both about 75 miles away. On an especially clear night, the Los Angeles skyglow showed up in the image of night sky above Pinnacles National Monument, almost 300 miles away.  Natural Bridges National Monument, Utah. The first park certified by the International Dark-Sky Association as a "Dark Sky Park." On most nights, you can experience a truly natural night sky here, a rare sight.  Capitol Reef National Park, Utah. A wonderland of sandstone, situated in one of the most remote areas of the country. Outstanding air quality combined with its remote location makes this starry sky a standout.  Great Basin NP, Nev. Clear air and hundreds of miles from the lights of Salt Lake City and Las Vegas. From the high elevations of this park, the Milky Way looks 3-D.
 Big Bend NP, Texas. A favorite area for stargazers, with a better view of southern skies than mid-latitude locations.  Denali NP, Alaska. Farther from Anchorage, the night sky is spectacular.  Glen Canyon National Recreation Area, Utah. * The upper portion of the park, between Natural Bridges and Capital Reef, is night sky nirvana. You have to get well away from Page, Ariz.
 Gila Cliff Dwellings National Monument, N.M. Tucked deep in the Gila Wilderness, this site is worth the drive.  Canyonlands NP, Utah. Grand View Point offers an excellent view of the cosmos.  Yellowstone NP, Wyo. The park is improving its outdoor lighting, lessening the impact of its own development.  Bryce Canyon NP, Utah. Ranger stargazing programs draw crowds May through October. One of the most accessible starry skies, not far off the beaten path, with numerous stargazing programs throughout the summer.  Hawaii Volcanoes NP, Hawaii. The summit of Mauna Kea should be outstanding.  Grand Canyon NP, Ariz. Dark skies once you get away from the developed areas or down below the rim.  Death Valley NP, Calif.* Stunning starlight in the northern portion of the park, farthest from Las Vegas and Los Angeles. 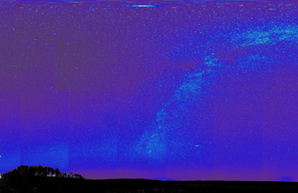 * Light pollution varies significantly across park. "It's surprising and somewhat daunting to see something that far away can have an effect," Moore said. Moore has analyzed more than 90 of the nation's almost 400 parks. He can count on one hand the number of clear, dark nights he has experienced without the glow from a distant light. But the Park Service is taking action, pledging to protect dark night skies as part of its recently released Green Parks Plan (E&ENews PM, April 19). Big Bend National Park, which spans the border of Texas and Mexico, is a perfect example of the dramatic change that can occur when a park switches to night-sky-friendly lights. Even though the park is in one of the darkest places in the continental United States, its exterior lights used to flood the Chisos Basin and shoot up into the sky so visitors could hardly see the stars. Over the past few years, the park replaced many of the 60-, 100- and 200-watt incandescent and fluorescent lights in its developed area with 1- or 2-watt LEDs, reducing its energy consumption by 98 percent and light pollution by -- no joke -- 10,000 percent, said David Elkowitz, the park's spokesman. "It's been a good opportunity for neighbors to see the difference, and they are all talking about it now," Elkowitz said. The Park Service needs those neighbors to join the effort. Springdale, a town of 530 permanent residents that hosts more than 3 million annual visitors on their way to Zion, takes its night sky very seriously. Not only is the star-filled night one of the main reasons people live there; it is a key part of the tourism economy that supports the town's tax base. Concerned about light pollution from increasing development, the community adopted an ordinance in 2009 that limits outdoor lighting to only the places where it is needed for safety, such as pathways, building entrances and parking lots. There was widespread community support for the ordinance, especially after Moore gave a presentation on the importance of the night sky, light pollution and dark-sky-friendly lighting, Dansie said. Hotel owners were concerned visitors would not be able to find their accommodations if building fronts were not well-lit. The ordinance was tweaked to allow hotels to light only their fronts, but they must follow dark-sky-friendly lighting practices like shielding bulbs. "You can certainly have lighting and still protect the night sky," Dansie said. "It's all about how you design that lighting and how you apply it on the property." There had also been some concerns about crime. A common misconception is that decreased lighting leads to increased crime, even though there is no proven link between the two. In fact, brighter lights can actually aid criminals by creating darker shadows in which to hide, Moore said. While Springdale is not a high-crime area to begin with, the lighting ordinance "certainly did not lead to a rash of burglaries," Dansie said. The north rim of the Grand Canyon shows a relatively natural night sky, with the Milky Way being the brightest light in night sky, and just a small amount of light pollution from National Park Service facilities. Click the photo to enlarge. Photo courtesy of NPS. The ordinance applies to both new development and existing businesses and residences. There is a seven-year grace period to comply because retrofits are not cheap. It is going to cost $3,500 to replace each of the town's 60 streetlamps, Dansie said. However, even places that do not have such laws recognize the benefits of dark-sky-friendly lighting. "It's more expensive up front, but then energy costs decrease over time," said Marc Mortensen, assistant to the city manager of St. George. The town is part of Washington County, the second-fastest-growing metropolitan area in the United States, which is creeping closer to Zion and Bryce Canyon national parks. St. George does not have a lighting ordinance, but in response to resident complaints about an overly lit car dealership, the town incorporated lighting guidelines into its development requirements. However, no existing businesses or residences are required to meet the new standards. "We know it's a sensitive issue; we're supportive of it," Mortensen said. "But we aren't enforcing it like some other cities are. We're more lenient." Poe talks informally with local hoteliers about how they can grow without unnecessarily illuminating a key tourism attraction. He emphasizes the long-term energy cost savings and the potential for increased business. During Bryce Canyon's recent astronomy festival that attracted 15,000 people, hotels were booked solid for miles around -- which doesn't happen on regular holiday weekends, he said. "We're trying to convince them there is a huge tourism industry that can sustain future growth based around the night sky," Poe said. The impact of light at night is not just about tourist dollars or the humbling experience of looking beyond the planet into space; scientists are very concerned about the impact lighting has on the animal kingdom. For millennia, species have evolved with regular cycles of light and dark. Dark is an essential element for nocturnal species to hunt, mate and hide from predators. The impacts of artificial light have been documented for a range of species, including migratory birds, bats, sea turtles and frogs. But it doesn't take a study for fishermen to know that fish bite differently when it's a new moon versus a full moon. "When we start to see artificial light reaching crescent moon stage, quarter moon stage, we become concerned, because you would anticipate biological effects at those levels because the moon altered them," Moore said. The night sky over Lake Mead National Recreation Area taken from Cotton Cove shows significant light pollution from Las Vegas, about 40 miles away. Colors indicate sky brightness -- white and red being the most light and blue being the least. The green arch is the Milky Way. Click the photo to enlarge. Photo courtesy of the National Park Service. When moths and other insects are attracted to lights, it draws them away from their important jobs of pollinating plants and producing offspring that feed entire food chains, Poe said. While the loss of a species due to light pollution has not been scientifically documented, researchers say it is a basic ecological principle that when habitat niches disappear, so do the species that depend on them. "If sky glow makes it so it never gets darker than the full moon, the species that forage under a new moon, they are probably going to drop out of your system," said Travis Longcore, a spatial science professor at the University of Southern California and a leading expert on ecological light pollution. National park managers may get more insight into how light is affecting the species in their parks soon. With increased computing power, Moore and his team are able to increase the resolution of the night sky images from 5,000 megapixels to 36 million. They are currently reprocessing the data they have collected over the past 10 years at this higher resolution, which will more accurately pinpoint sources of light as well as tell them how much light is falling on a specific patch of ground. Biologists will be able to use the data to determine if the amount of light is beyond a healthy threshold for the species living in that ecosystem, Moore said. "We are at the point," he said, "where we have very good, hard data showing in many different terms what the impacts of artificial light at night are in a particular spot in a national park." Since the 1950s, outdoor lighting has become five times more efficient, but the United States is using the same amount of electricity because it has added so many lights, Moore said. Many of those lights are not shielded, and unnecessarily point skyward. (The most famous example: the vertical light beam shooting up from the Luxor Las Vegas, the strongest light in the world, is visible from outer space and from parks more than 200 miles away.) And while they are more energy-efficient, the bulbs burn longer and brighter than required at night. "There are so very few cases where we need lights on, full intensity, all night long," Moore said. Lighting that is dark sky friendly would dramatically reduce the amount of light being scattered through the sky, instead directing it only when and where needed, at appropriate intensity and colors. For example, instead of having streetlights controlled by solar cells that flip them on when the sun goes down, they could be controlled by wireless computers, which could turn them on, dim them or even turn them off when not needed. "I talk to park rangers who want to give a sky show, and there is no switch for the lights," Moore said. "The lights are photo-celled; there is no off switch." These principles can apply not just to streetlights but to illuminated business signs. For example, instead of having black letters on a white sign, reversing it to a black sign with white letters significantly reduces the amount of light shining through. A team at the University of Southern California is developing a design guide illustrating these principles for NPS and other landscape architects and builders. Moore said that if dark-sky-friendly lighting principles were broadly implemented, it could reduce the nighttime electricity demand between 20 and 50 percent, which would save on the order of $10 billion a year in electricity bills and 44 million metric tons of carbon dioxide emissions. "These are exciting times because a lot of the tools that we need to do this right -- not just right, but really well -- are available," Moore said.